Bacopa is an aquatic plant and the primary herb in many Ayurvedic formulas used to improve memory and/or concentration. As such, it aids learning, retention, and clarity. Like many rasayana herbs, it is an antioxidant and has anticancer effects. It is also antiparasitic and improves gastrointestinal health. Contents: certified organic Bacopa monniera herb powder. Brahmi supports the mind and nervous system, helping to improve memory and sustain intellectual effort. The leaves are considered to be very sattvic, i.e., pure as opposed to dull or stimulating. Gotu kola aids restful sleep and is a natural blood purifier and soil remediation plant. It was used by Machchamuni Siddhar for his kalpa. In a way, brahmi is tridoshic because it reduces excess vata in the mind, is cooling to pitta, and decongesting to kapha. Contents: certified organic Centella asiatica herb powder. Contents: certified organic Terminalia chebula fruit powder. Contents: wildcrafted Terminalia chebula fruit powder. This intensely bitter herb promotes healthy flow of bile and respiratory comfort. It clears the throat, head, and lungs while simultaneously boosting immunity. Though sometimes considered a liver herb, it is also regarded as an immune herb, but studies suggest it is highly specific for both typhoid and fungal infections. There is a lot of research on this herb, everything from antivenoms to AIDS. It has many applications in cancer treatment as well. Contents: certified organic Andrographis paniculata powder. Contents: certified organic Holarrhena antidysenterica bark powder. Contents: certified organic Rubia cordifolia root powder. Contents: organic Cyperus rotundus root powder. Contents: certified organic Piper longum fruit powder. Contents: Emblica officinalis, Terminalia belerica, and Terminalia chebula. 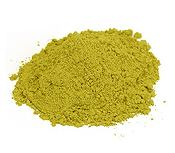 Contents: certified organic Embelia ribes fruit powder.